I did not expect to be able to chase today, and was pretty much unprepared to do so following one of the most hectic weeks at work this year. But my meeting this afternoon ended unexpectedly early a little before 3, and with intense storms in the area, I decided to head out. Here is what the St. Louis radar looked like at 3:00 p.m. The Edwardsville Friday afternoon traffic was dreadful, and it took me half an hour to get home, double the normal time. I also had to make a brief stop for film - remember I SAID I was unprepared! That only took a couple minutes, but the traffic delay was not good when the storms were moving 40-60 mph! A quick glance at TWC showed the best storms coming across St. Clair Co. to my south, and these would have the warmest, juiciest inflow, being at the southern edge of the area of storms. But I knew I could not get to them without a core punch - movement around 50 mph - and I was not about to try that since 1) my car is 6 weeks old and 2) hail reports were coming from nearly every storm. So I went for less-impressive but still good storms to my NW. One near St. Charles - one of several that dropped large hail in that area - had almost a hook-echo look to it on the TV radar and I thought I might be able to get to that by heading north on I-55, which I did, around 3:30. After one intense storm raced eastward just to my north, crossing the highway maybe 20 miles ahead of me, I poked through a weaker one behind it and saw a nice backsheared anvil to my NW. Around this time I heard a SVR warning for N. Macoupin Co., with radar showing a hailer near Palmyra. Had to be that storm. Here is the St. Louis radar from around that time. When that warning expired at 4:15, a new one went up for 15 more minutes for NE Macoupin Co., storm near Girard. This was based in part on a report of 3/4 inch hail near Modesto at 4:07 p.m. I figured I could intercept near Farmersville, and I did. As I approached Farmersville on I-55, the storm kind of tried to form a wall cloud - a small, rounded lowering under the main updraft - but I wouldn't say it quite got to something that could be called a true wall cloud. By the time I reached Farmersville around 4:25, there were small, ragged, scuddy lowerings, but no visible rotation, under the main updraft, and a small, intense rain and hail shaft right behind these features. I watched and photographed for not more than 5 minutes, then headed back south to avoid being overrun by the storm. Just after 4:30, a new SVR was issued for this storm, for Christian and Sangamon Counties. Now, the storm was evolving rapidly into a squall line. 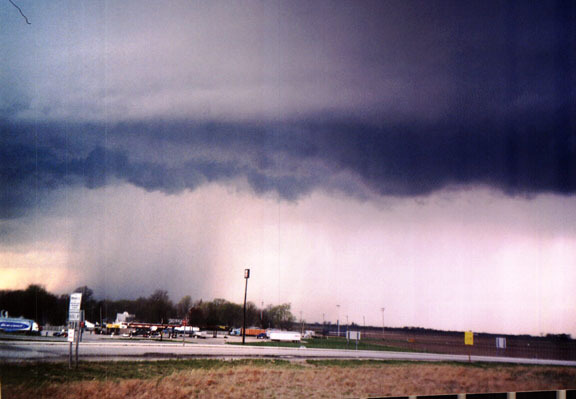 I stopped for a quick pit stop at the rest area near the Taylorville exit, and there were several people who had driven through the storm who were really freaked out by what they had come through - intense hail and low, rapidly moving clouds. Some thought they had seen funnel clouds, but if so, that must have been farther north. I watched the storm passing to my north, and though becoming more linear, it remained intense, as can be seen on this radar image from just before 5 p.m. Note also on this image the very intense cell in Clinton Co., to the ESE of the St. Louis area. This cell, associated with the cluster that passed just south of Edwardsville, produced a tornado near Bartelso, IL minutes after this radar image was captured. As the storms lined out to my west, I noticed another very intense storm near the southern end of the line as I approached Benld shortly after 5. 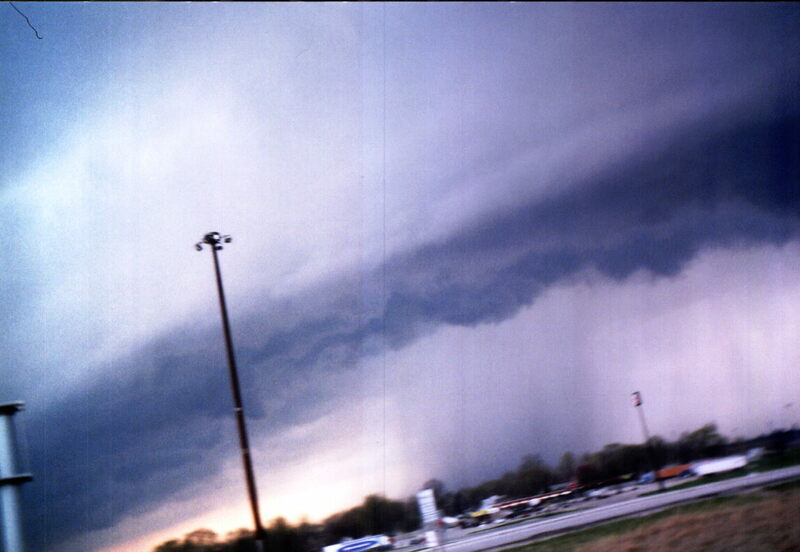 Around this time I learned that this storm was severe-warned. I was concerned it might overrun me, but I was able to cross just ahead of it and stop to watch the show from the Hamel exit. At this location the core was just a mile or two north of me, as the southern end of the storm had built a little way into Madison Co., and very low-hanging scud passed over - again no rotation. The storm passed quickly to the north of my location, and I headed home, arriving home around 5:30. As I suspected, the storms that were to my south when I started out proved to be the storms of the day, producing the above-mentioned tornado near Bartelso. Here are the local storm reports for the St. Louis CWA. But given that chasing the storms passing to my south was not feasible, that I was totally unprepared, and that I only had to drive a total of about 100 miles, this was not a bad first chase of the season. Comments are always welcome, especially from anyone else who may have been on this storm. You may email me at jfarley@siue.edu. Return to Weather Observations page.